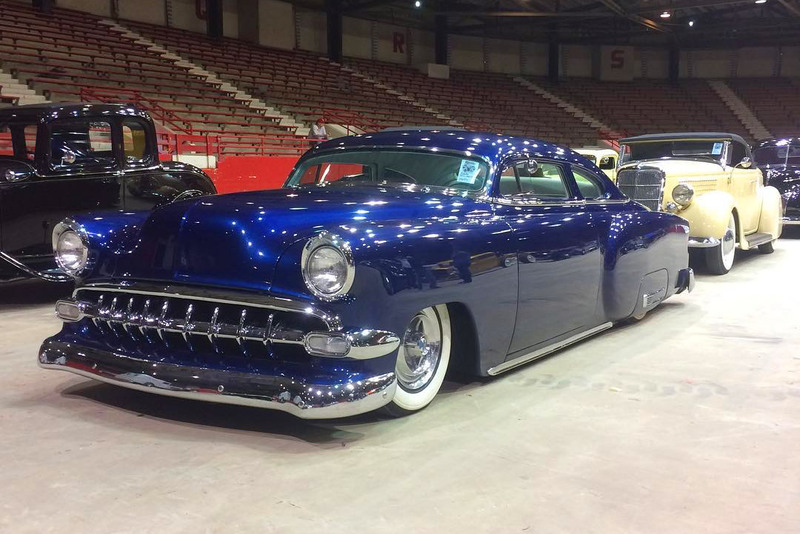 Rogelio Martinez (Roger) from Houston, Texas has been into old cars for as long as he can remember, but when he visited a Texas Good Guys Cars show he spotted a gorgeous chopped 1950 Mercury. From that time everything changed, he just knew he had to have a Custom like that one day, so the search began. In 2000 Roger came across an cheap 1954 Chevy Sedan in New Mexico. The car was very rough, incomplete with no engine or transmission, missing the floor boards, wiring no glass, no bumpers, and the fenders were held together on the car with 4 bungee cords and 4 bullet holes. Still Roger managed to see that this project was ideal for him, and when he closed his eyes, he saw the car in front of him how it now looks. When he brought the project home his wife could not quite see that same picture and according Rogelio the look on her face was priceless. 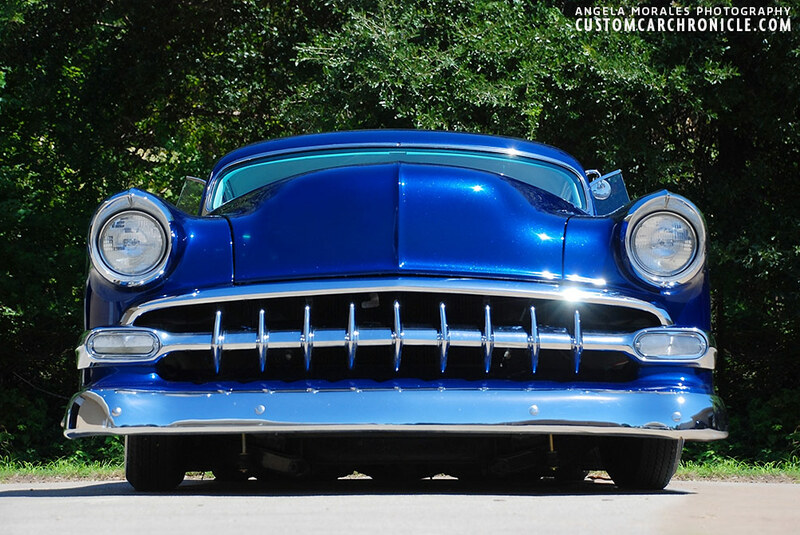 Smoothed hood, ’56 Oldsmobile headlights, removed bumper guards and 4 additional ’54 Chevy grille teeth, give the Chevy a very tough look. 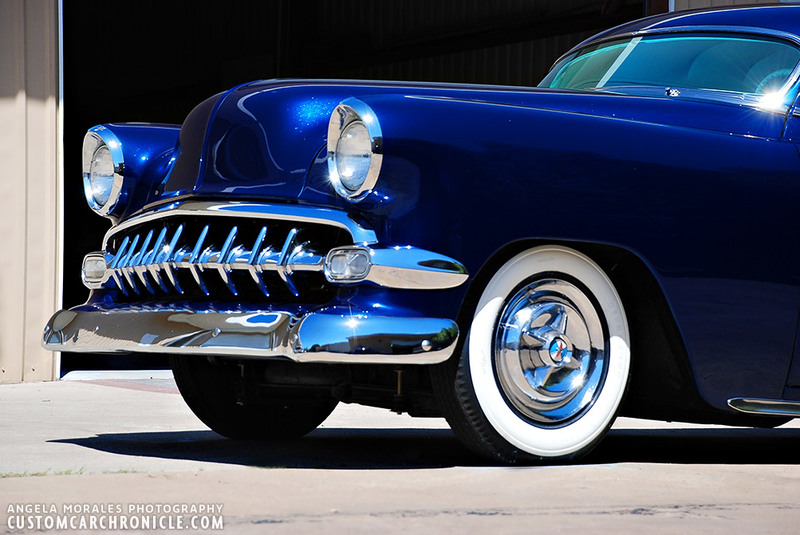 The 1956 Oldsmobile front fenders and headlights were matted to the Chevy units and the Chevy wind-splits eliminated in the process. Over time Roger located all the missing parts from visiting California swap meets, for the dream custom he had in his mind. The ’56 Packard taillights, bumpers, the ’56 Oldsmobile front fenders, the floor boards and a new wiring kit, bumpers, and all new glass. 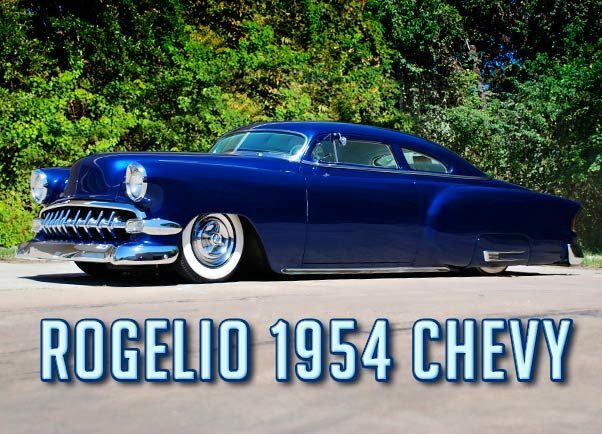 The top on the Chevy was chopped a heavy 6 full inched with leaned forward B-pillars by Miguel Zarate. 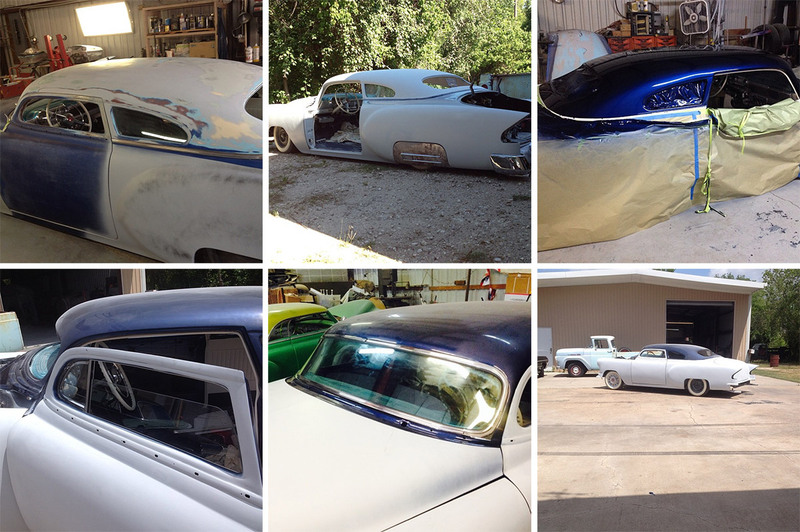 He also added a new rear window which is a turned upside down ’51 Chevy Business Coupe unit. Adrian, another friend and member from the Los Cochinos Car Club did all the work on the beautiful looking front fenders. 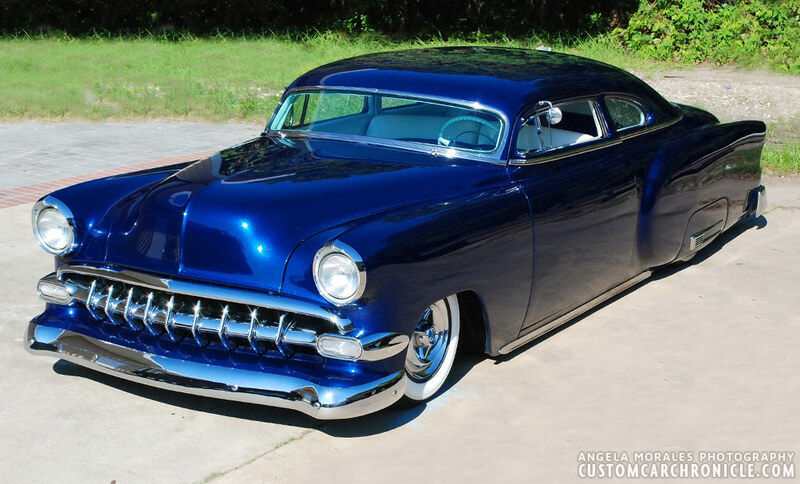 He incorporated the top portion of the ’56 Oldsmobile fenders to the bottom half of the Chevy fenders. 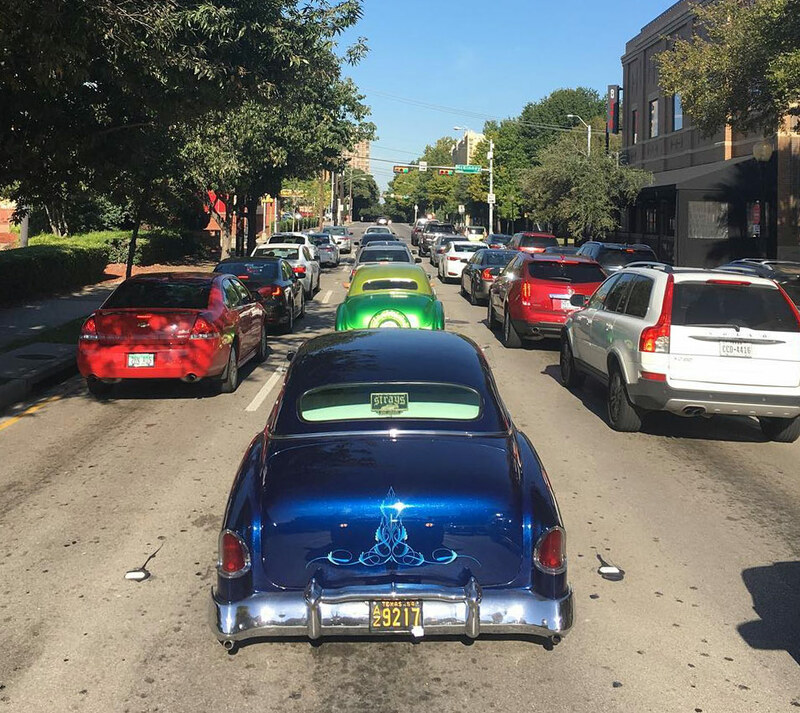 The rear fenders had to be modified to make the ’56 Packard taillights fit, a job also handled by Strays Car Club president Miguel Zarate. 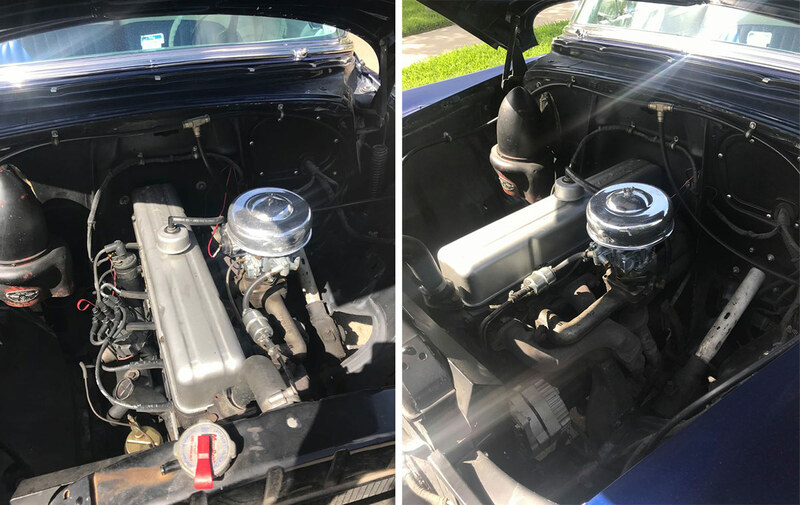 A stock ’54 Chevy rear bumper would not work right with the new extended rear fenders with Packard Taillights, so Roger found a pair of ’56 Mercury units that had the perfect look for him. 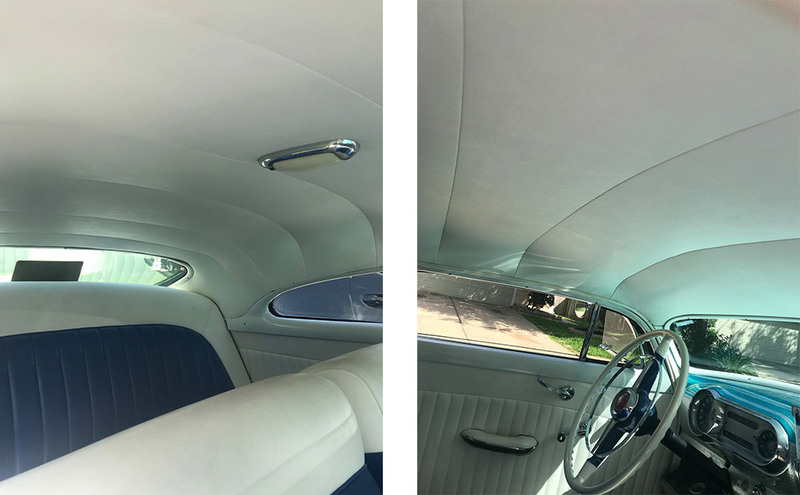 They shaved off most of the trim, but Roger kept the belt line and rocker trim to make the car look longer and sleeker. 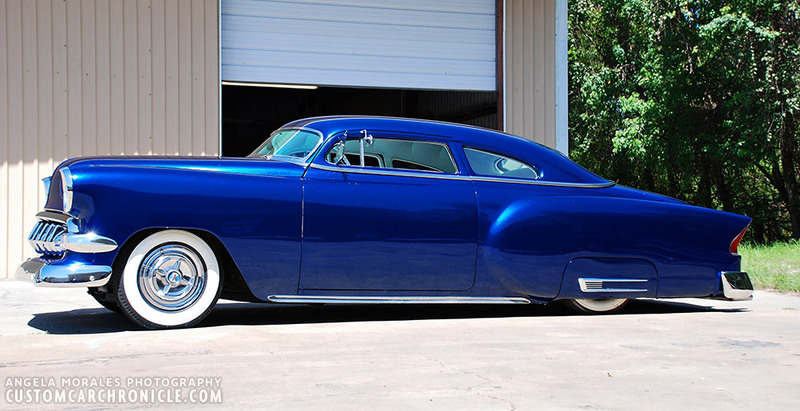 All the final body work in preparation of the beautiful deep metallic blue paint job was done by David “Dutch” van Renzellier. The paint was applied by Alex Hernandez “Garage Arte”. 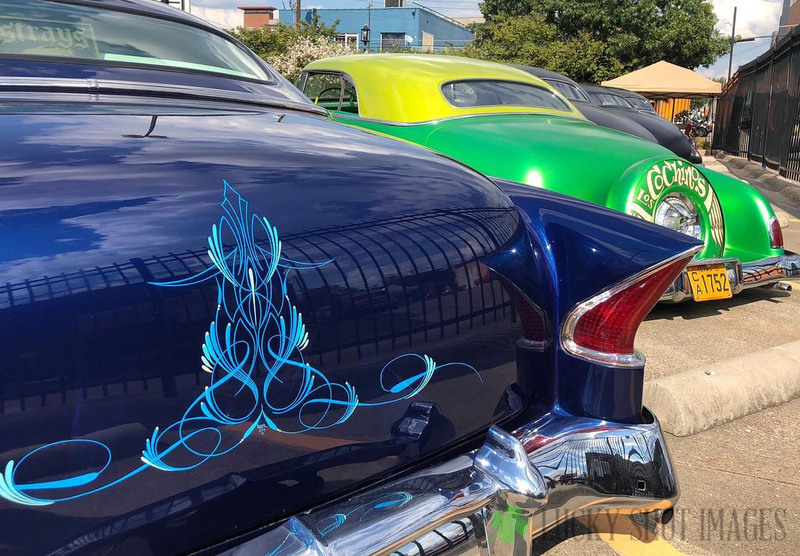 Miguel Zarate did the work on incorporating the ’56 Packard taillights into the Chevy rear fenders. Notice the notched rear bumper to allow the exhaust pipes to sit a bit higher. This low angle side view shows the smooth flow of the heavy, 6 inch chopped top. 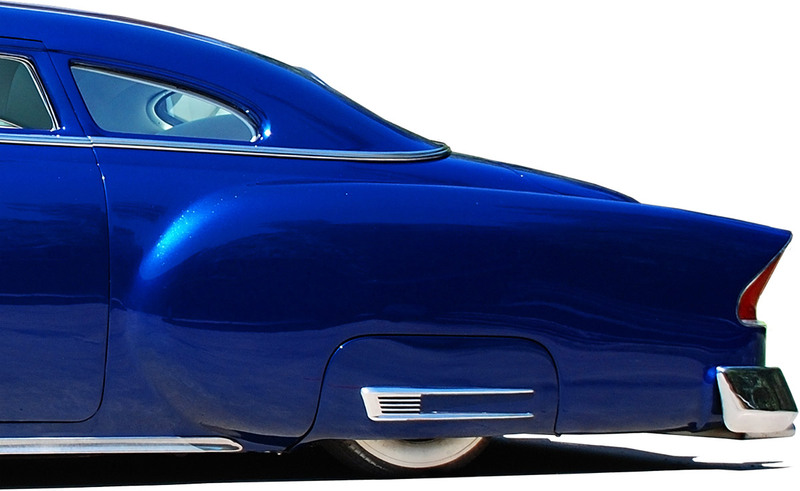 The B-pillars were leaned forward to help with the streamline shape. The Airbag set up allows for any stance you prefer. Close up of the Oldsmobile front fender addition to the the Chevy. The 1956 Dodge Royal Lancer hubcaps on wide whites is just the perfect combination for Roger’s Chevy. Extended down and flush fitting skirts with Buick trim. 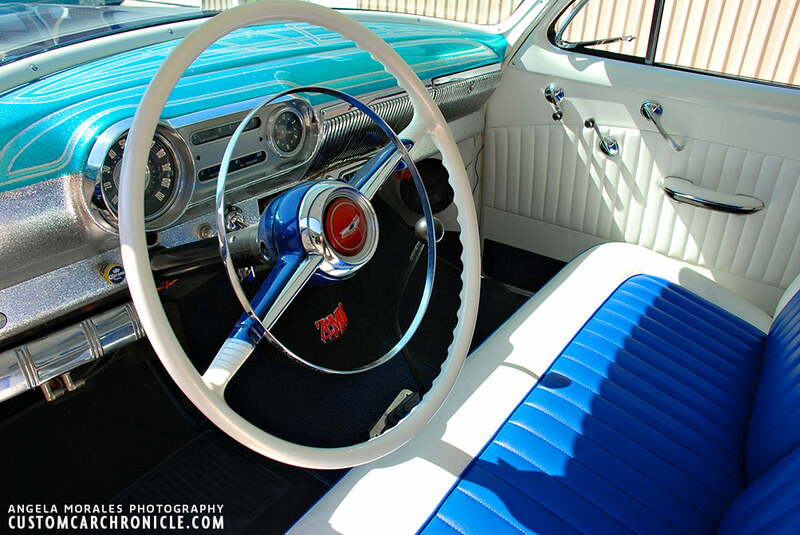 A stock ’54 Chevy steering wheel was beautiful restored and painted to match the body and interior. 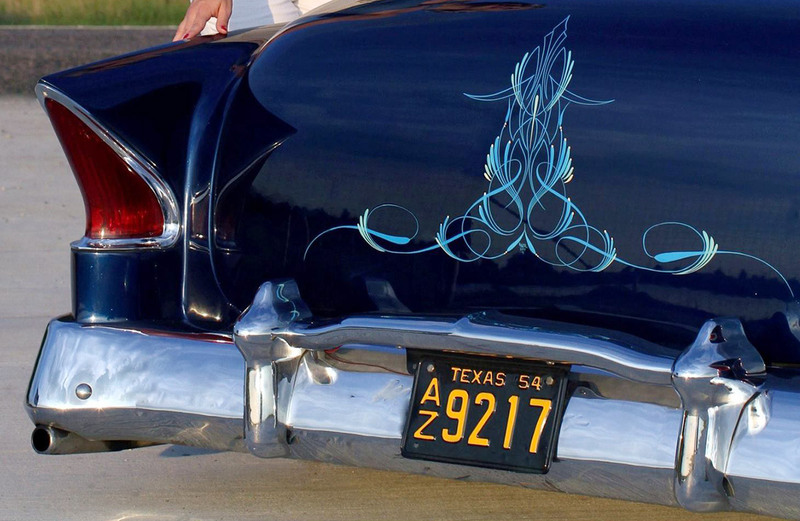 The Low-Rider inspired Metalflake and Candy painted dash is the work of Miguel Zarate. 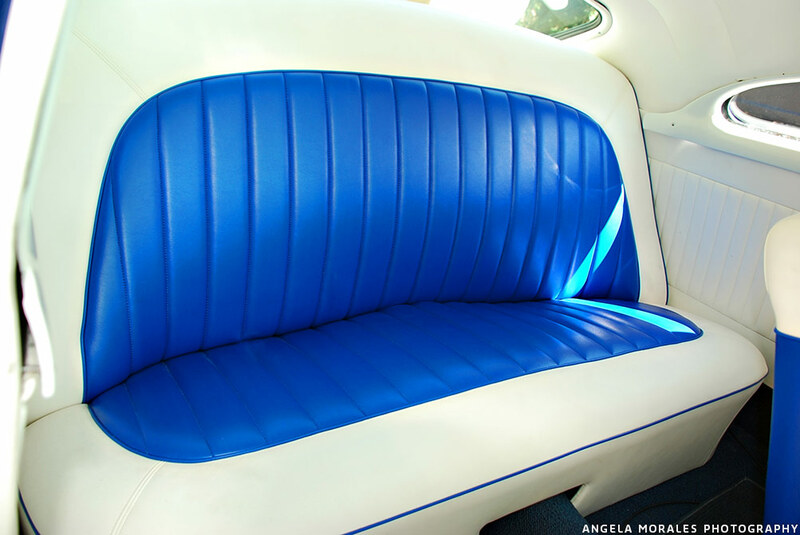 Stock ‘Chevy seats were beautifully upholstered in medium blue and white leatherette by Abel from Abel Upholstery in Houston, Texas. Close up of the Metalflake and candy painted dash. 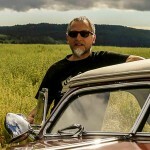 Roger’s Chevy was also subject of famous Car photographer Trent Sherrill Photo Shoot. Cruising… on their way to another car show. At one of the many outdoor car shows Roger went to over the past couple of years. The beautiful pin-striping was done by Rogelio himself. The 235 in-line 6 engine with the 4 speed transmission is reliable and more than capable to make it a daily user. Eric doyon “Lefty” came up with the bright idea of installing the Webber carburetor on the car. A few in progress photos along the way. 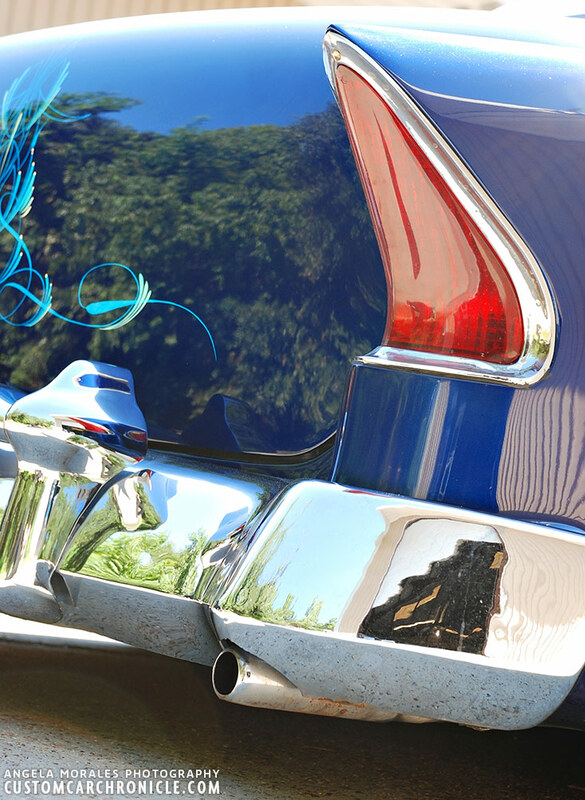 Metalflake and Candy paintwork in progress by Miguel Zarate. 1956 Oldsmobile front fenders sections grafted to the Chevy units. 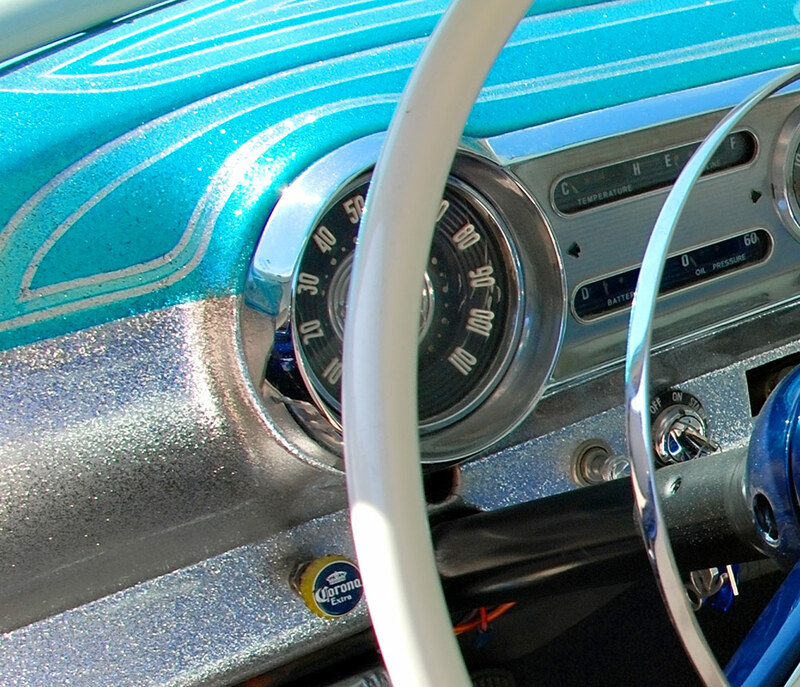 Dash paint done in metal flake and candy, patterns done by Miguel Zarate in north Hollywood ca.